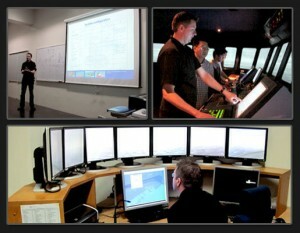 DP (Dynamic Positioning) Induction Course was conducted by Maritime Institute Willem Barentsz (MIWB) last 23 to 26 May 2011 at the new simulator center complex, AJSU-IMMAJ Campus. Said training course was facilitated by Mr Auke Rujig, senior DP Instructor of MIWB, through the efforts and coordination by MAAP President and Capt. Stephen Cross, senior maritime instructor of MIWB. To prepare and develop future instructor that will operate the DP center of MAAP and who shall facilitate future courses that may be offered using the DP simulator such as the Basic DP operators course and Advanced DP operators course. To facilitate future certification requirements from Nautical Institute (NI) or the Norweigan Maritime Directorate (NMD) by offering DP certification courses at MAAP under an accredited DP training center such as MIWB. To verify operational readiness of MAAP DP simulator equipment and facilities in preparation for future conduct of DP courses after obtaining certification of our DP center from NI or NIMD. Majority of the attendees are MAAP alumni as recommended for their willingness and strong desire to become future DP instructors (DPIs) of MAAP who will operate the MAAP DP center once certified by NI or NMD.